A ready to use, matt, solvent based protector with special components which enhance and intensify the natural beauty without imparting a high sheen. 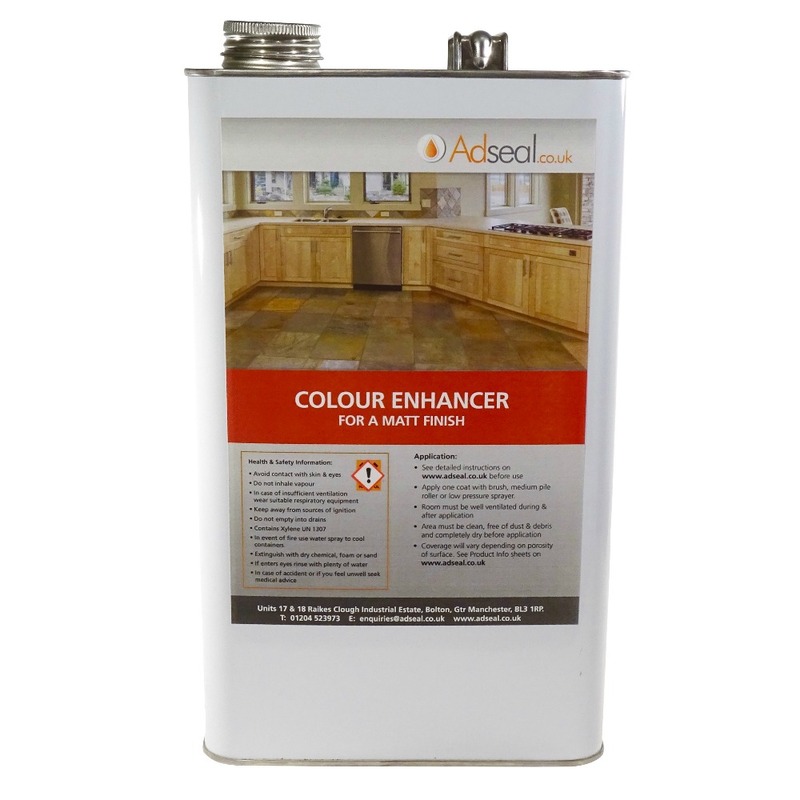 Colour enhancer has very little effect on the slip resistance of the surface and largely prevents staining whilst facilitating routine maintenance. also engineered paving products such as Marshalls, Bradstone, etc. Indoors and lightly trafficked areas, with correct maintenance and depending upon surface type, potentially 10 years plus. Externally, colour will remain for 1 – 2 years although protective effect will remain for longer, potentially 4 – 6 years, depending upon surface type. A major design feature of this product is that it is easily re-coatable and does not need stripping before future treatment as maintenance coats cross link into original forming a monolithic layer. Down time is minimised with rapid cure additives. Fading of the colour and reduction in protective effect take place more rapidly in heavily trafficked areas and these areas can be easily ‘touched up’ without the need to strip the original coat. Lower trafficked areas will only need retreating very occasionally, if ever. Sweep regularly to remove abrasive dirt and grit from surface and mop daily using a mild detergent. Spills and marks should be wiped up as soon as possible and not allowed to dry on. Should signs of wear appear, a maintenance coat can be applied. Clean and thoroughly dry surface to be treated. Apply single ‘tight’ coat in accordance with standard application instructions. The new coat will cross link into earlier coats so there is no need to strip unless resin build up or blemishes are an issue.